When you plan an island getaway, shopping may not be high on your to-do list. But the unique options on Put In Bay is an opportunity you won’t want to miss! Even the pickiest shoppers will be delighted with the gifts and fare they find from local artisans, clothiers and craftsman. Once you arrive on the island, you will understand that bringing home a few souvenirs is an absolute must. You will want to look back fondly on your trip to the beautiful Put In Bay Island for years to come. Check out the one-of-a-kind stores that Put In Bay has to offer in our comprehensive list below. 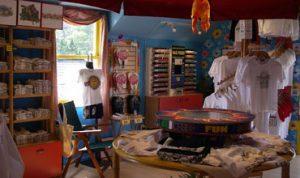 When visiting or staying on the island, taking home a shirt or memento is a must! With such an impressive assortment of items to offer, the choices abound. Be sure to take the time to peruse the local establishments. Here, you will be delighted with the unique apparel and jewelry. Moreover, that special item from your favorite downtown shopping spots will warm you up through the cold Winter months. Another great aspect of the shop scene is the convenience. Perhaps you forgot to pack a bathing suit or need a beach towel. There are several options! So, to pick up the things you need, be sure to shop local with our great stores. Furthermore, the fashionable options will have you looking fly. Pool Bar ready! Get the most time to browse by staying overnight. Staying on the island is the best way to see all of the great offerings. Check out a great Put-in-Bay Cabin or Put-in-Bay Waterfront Condo to Book Your Spending Spree! Our lodging partners look forward to hosting you. There is never a bad time to put an island in your life! Gather your reusable shopping bags and put on your walking shoes! Shopping in Put In Bay is a special experience for friends, families or even someone who needs a little “me time.” If you are not sure where to start, try Bay View Gifts and Apparel. The owners strive to provide shoppers with the perfect gift or home decor item to bring a little nautical vibe to any home. Or venture into the Crystal Cave Gift Shop, which sells some of the island’s best treasures: geodes, crystals and gems from the beautiful caves and bottles of wine from Ohio’s oldest winery, Heineman’s Winery. But you can’t stop there! Just as the island offers natural beauty, its shops offer handmade, natural items, too. At Freshwater Remedies, you will find skin cleansers, balms and toners, along with incense and jewelry. However, there’s more than one way to catch that island vibe! At Great Lakes Tobacconist, the owner personally blends cigars to invoke different parts of the island—a special treat for the special people in your life. Even fashionistas can find the perfect fit during their shopping excursion in Put In Bay! Misty Bay Boutique boasts a highly curated collection of clothing, and at Jessie’s Jewelry you will find delicate, elegant jewelry that truly embodies the island. From surf shops and gift shops to trinkets, T-shirts and timeless treats, you will find anything and everything at the shops in Put In Bay! Don’t put off your shopping trip any longer. Make your Put In Bay reservations today!